So ever since I found out about Juice & Java from Toni’s suggestion last week to read this review, I’ve been pretty excited to check it out. Most of their locations are in Miami, but they happen to have one about 5 minutes from my house! I immediately emailed them to find out if the soy cheese they use is vegan, and they got back to me promptly to let me know they use Follow Your Heart brand, which is. My mom and I had almost dined here a while back, but it was too packed the day we went, and we were on a time constraint. Luckily today I got out with time to beat the lunch crowd, and I’m so glad I did! I left my phone at work, accidentally, but was able to snap some pix with my mom’s. First of all, they had SO many things that I could eat and that sounded delicious, that I wasn’t even sure where to begin. Which is a rare occurrence at a non-vegan restaurant. Their menu is huge and the wait staff is really friendly. You can pick-up/take out or sit down for service. We did the latter. 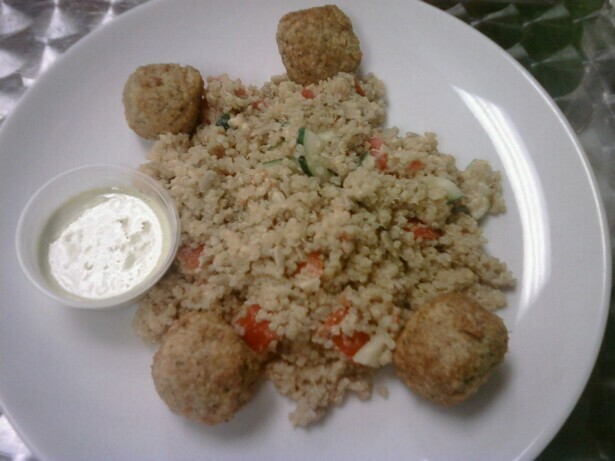 I settled on the Falafel Quinoa Specialty, $8.95, which has baked falafel, a side of tahini sauce, and organic quinoa tossed with hummus, cucumbers, and tomatoes. There were also some sunflower seeds in the mix. It was delicious, and I was happy to have my falafel without it having been deep fried. We both really enjoyed our meals, and were full with our servings. I had been trying to see if they had the vegan cupcakes (Bunniecakes) when we first arrived, and sure enough they brought out a glass case filled with mini ones while we waited for our food. They had about 4 or 5 flavors, some gluten-free, all nicely decorated. I asked the waitress for her recommendation, and she said I should try the red velvet. 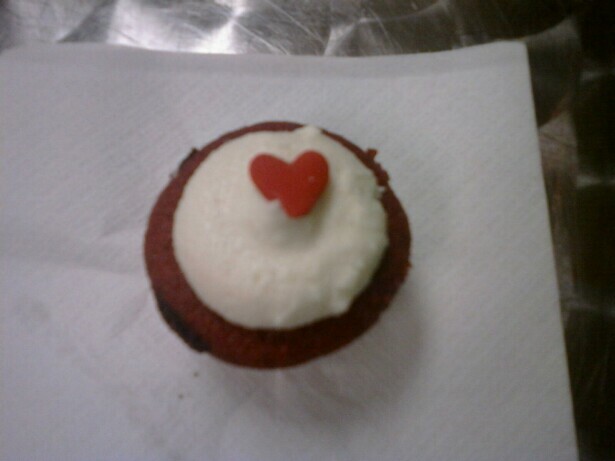 Red Velvet mini cupcake (gluten-free) $1.50 . I had only had red velvet cake one other time, and hadn’t been that enthused about it, but respected her guidance. It was really good, very moist, and the [vegan] cream cheese frosting was superb. At only $1.50 I really should have taken a few home, but I enjoyed my morsel, and went happily back to work. Juice & Java will definitely be getting my repeat business. They are so well priced ( & close!) and have such an extensive menu that this makes for an easy place to go to with any crowd. 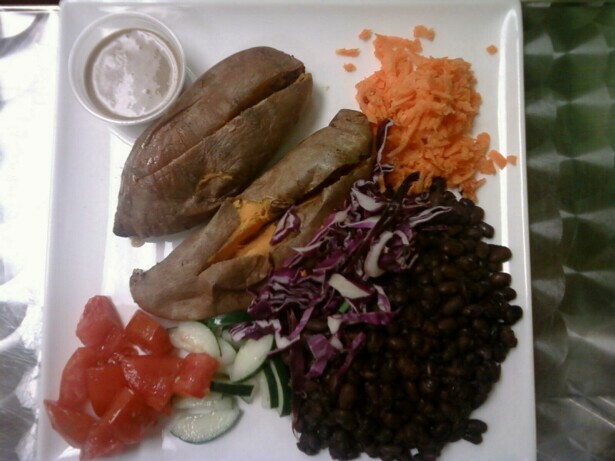 They’re located by the Town Center Mall at 21316 Saint Andrew’s Blvd, Boca Raton, Fl 33433 (contrary to the address on the website, which says State Rd. 7, do they have two Boca locations?) and open 7 days, 8am to 8pm, 561-852-2230.